Young women are urged to eat plenty of leafy greens and take folic acid (folate) supplements if they are pregnant or expecting to become pregnant in the coming year. A diet rich in folic acid is highly important in minimizing the risk of miscarriage and birth defects that affect a baby's brain and spinal cord (including spina bifida). A team of researchers in Australia have discovered there's more to the folate story than that, though. They've discovered that too much exposure to the UV rays of sunshine depletes folate levels in spite of healthy diet and supplements. 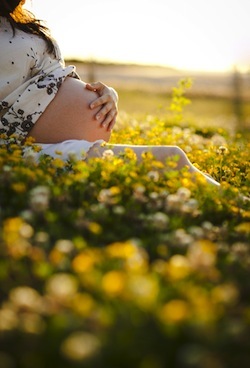 When women of reproductive age spend time in the sunshine between 10:00 in the morning and 3:00 in the afternoon, when the sun's intensity is at its daily peak, folate levels are reduced by as much as 20%, according to Professor Michael Kimlin and Dr. David Borradale. The research team is part of the Queensland University of Technology (QUT) AusSun Research Lab in Brisbane, on the sunny east coast of Australia. The QUT study, the first of its kind to explore the effects of sunlight on folate levels, involved 45 women aged 18 to 47. The women who received the most sunlight exposure during the peak hours were found to have the most depleted levels of folic acid. None of the women in the study were proven to be deficient in the nutrient but some tested at the low end of the normal range. If a woman has spina bifida and wants to become pregnant or if a woman has had a baby with spina bifida, her physician may prescribe folic acid supplements in doses as high as 4,000 mcg. The same prescription dose may be recommended for women who have a family history of the condition. It is important to understand the birth defects that folate protects against occur in the very earliest days of pregnancy, often before the woman even suspects she's pregnant. This is the reason why it is so important to routinely get the recommended daily recommendation of this vital nutrient well before conception. For optimum protection, avoid the sun during peak hours and use UV-blocking sunscreen when going outside for any length of time at any time during the day. Incorporate plenty of leafy greens such as spinach, dark green and red leaf lettuces, and vegetable greens such as beet, chard, collard, kale, mustard, and turnip. Other naturally folate-rich foods include citrus fruits, legumes, and whole grains. Folic acid is typically added to flours, bread, and pasta. The Australian favorite — vegemite — is folate-rich, too. "UV exposure found to lower folate levels in young women." QUT / Health / News. QUT. Mar 19, 2014. Web. Mar 27, 2014. "Folic acid fact sheet." Womenshealth.gov. US Department of Health and Human Services. Jul 16, 2012. Web. Mar 27, 2014.